I am finishing off my latest 10 quilt blocks. These go through several stages of development, and I cannot release any designs until I am absolutely happy with the overall look of them. Some designs look perfect on my software even before their first stitchout after being digitised. Others do not quite look right, and some get trashed as unworkable. This design originally didn’t flow as there was a gap between the ribbons. Filling in with triple scallops gives an interesting shape to the design which I love. 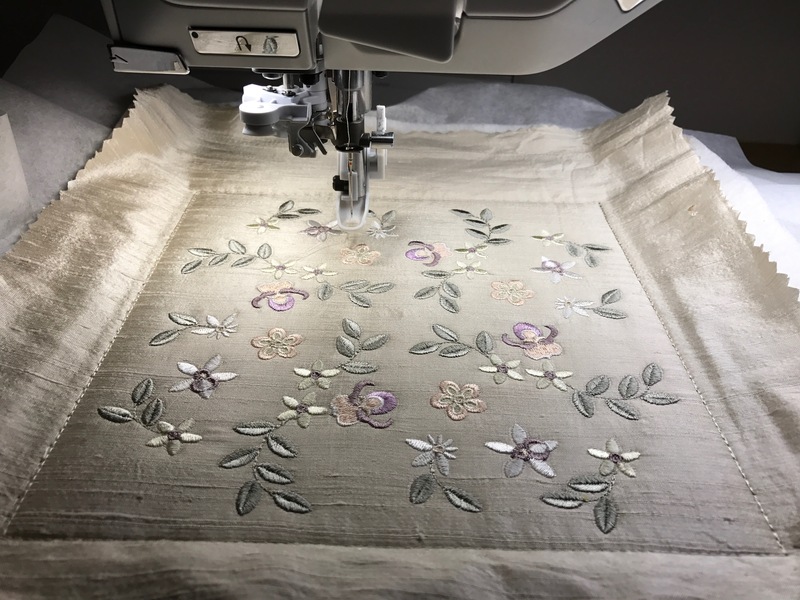 Although these blocks are part of the Beatrice collection which have been digitised for silk threads, I stitched this one out in Sulky Rayon 40wt rayon, making a few changes. 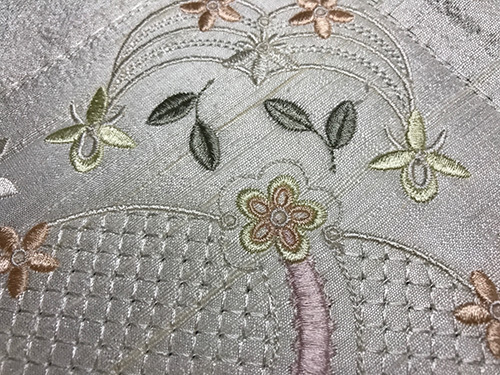 The edges of the ribbons are listed in the designs as being stitched in the same colour, but I used a slightly dark thread for the edges, which worked beautifully. I love the tiny orchids in these designs, as well as the bees. This collection is named after one of my grand daughters who we call Bee. 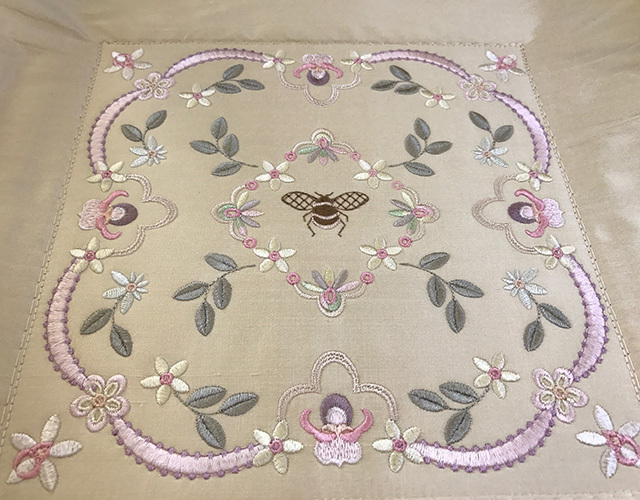 If you are looking to get a light coloured effect be careful that you do not use too dark a thread for your bee. 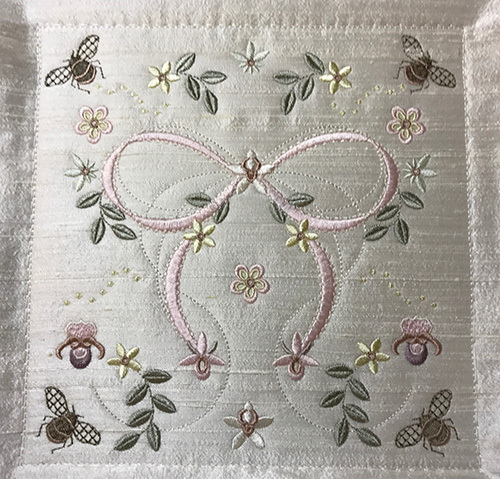 One of the things which I tried and was not pleased with was the use of some variegated thread, seen in the leaves around the bee. Remember that the thread stitches out quite differently from how it looks on the spool. I really am not a fan of variegated thread, but you may love the look. Here is the finished design. 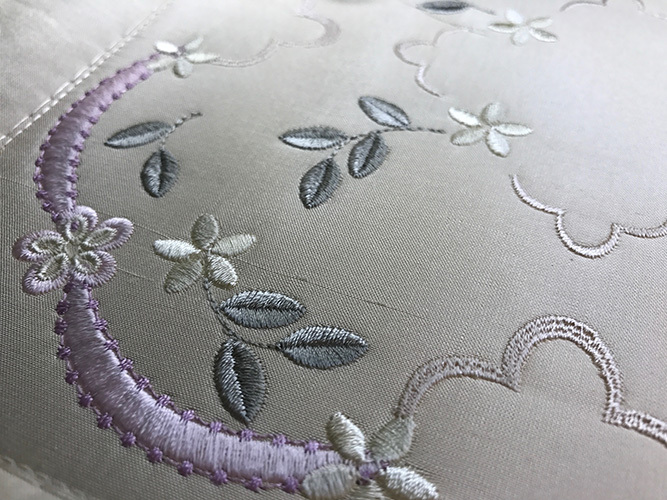 When I tested these designs I hooped some quality stitch and tear and then attached Floriani Embroidery batting to this with Temporary adhesive spray. I love this product as it does act as stabiliser and batting, but if you want to make it go further use a stabiliser underneath. Adhesive spray was also used to attach the silk dupion to the batting. I have tried to add variety to this set, including a very simple design shown below. Remember that with a little editing in your software you can simplify a design by removing some elements, or one colour way. Other designs are more complicated and will take more time to stitch out. This one even contains some buttonholes. How about carefully cutting them and threading some ribbon through them if you do not use a batting with a high loft! When you view most of the blocks you will see they have been created so that each quarter is more or less the same. 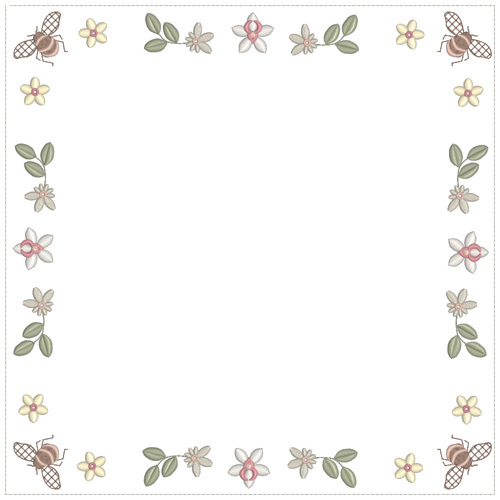 However I created this block to emphasis the exquisite bows and ribbons in the Beatrice collection. In 2016 I created a tutorial for quilting blocks in the hoop. Tutorial 7. This is packed with invaluable information and ideas as well as new designs. 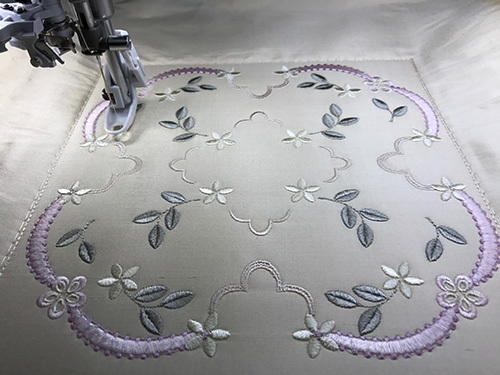 As it included a frame to increase the block size to 10″, a frame has also been created for this set of blocks, which allows you to stitch out a larger 10″ block by placing any of the blocks inside the frame. I will add another to the second set of designs coming out later this month. 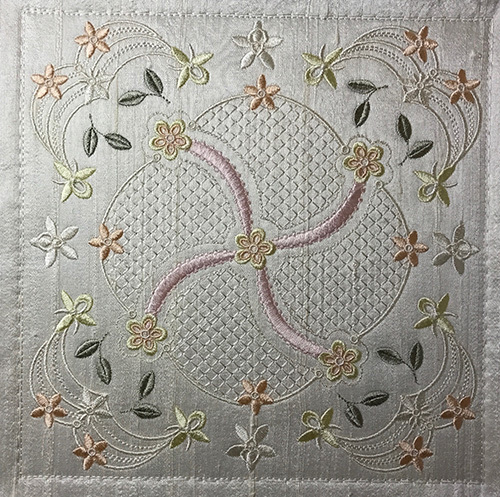 When I stitched out my last block on ivory slubby silk dupion, I combined a few colours to cut down on the thread changes to save time, and was delighted with the results. 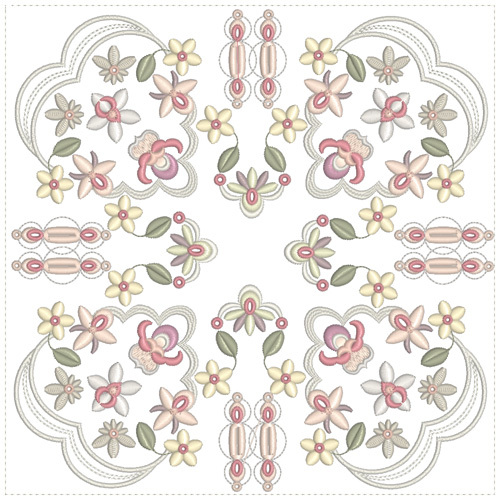 I combined the last two colours, the centres of the flowers, and also combined most of the whites and creams, replacing the pale pink flowers for a pale peach. I think this is my favourite in the set. 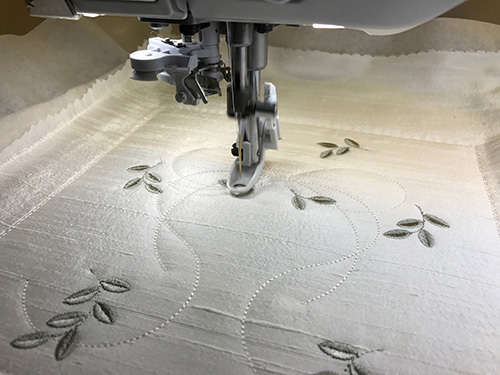 A little piece of advice: having read an article about machine embroiderer’s unlikely to ask for embroidery equipment for Christmas, I asked my husband to give me some Kai embroidery scissors. Such an excellent gift, as they are so light and sharp. I thoroughly recommend them to you all. These Beatrice designs are being released today and will be available at an introductory price of $25 until January 27th 2017. Watch out for the second set. 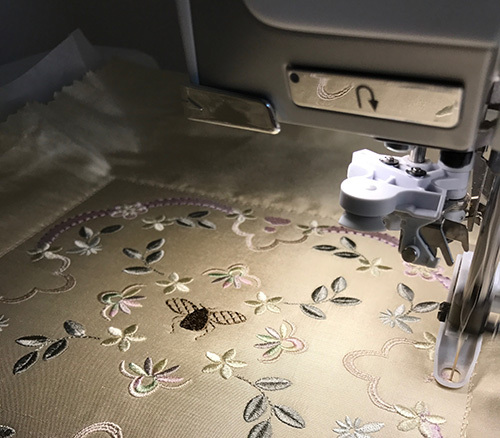 This entry was posted in Discussing machine embroidery, New Designs and tagged batting and wadding, machine embroidery, quilt blocks. Bookmark the permalink. Oh my—–you have outdone yourself. These blocks rise to the level of needle art. Oh my gosh Hazel, they are absolutely beautiful, I love that you give us lots of pictures so we know what you are explaining and also gives us inspiration.